Recently I tried out Footner. 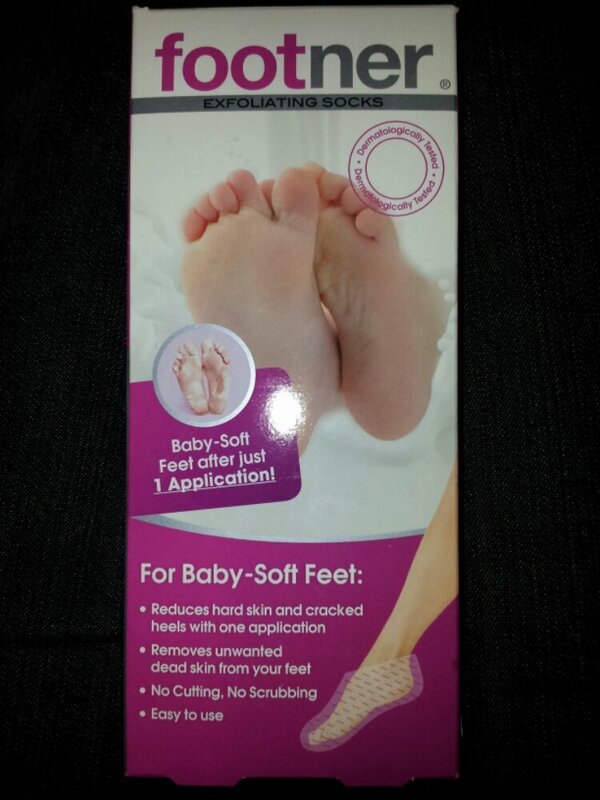 Its a product I had never heard of that is meant to remove hard skin from your feet. I wasn’t sure what to expect, and it is a weird looking item for sure. 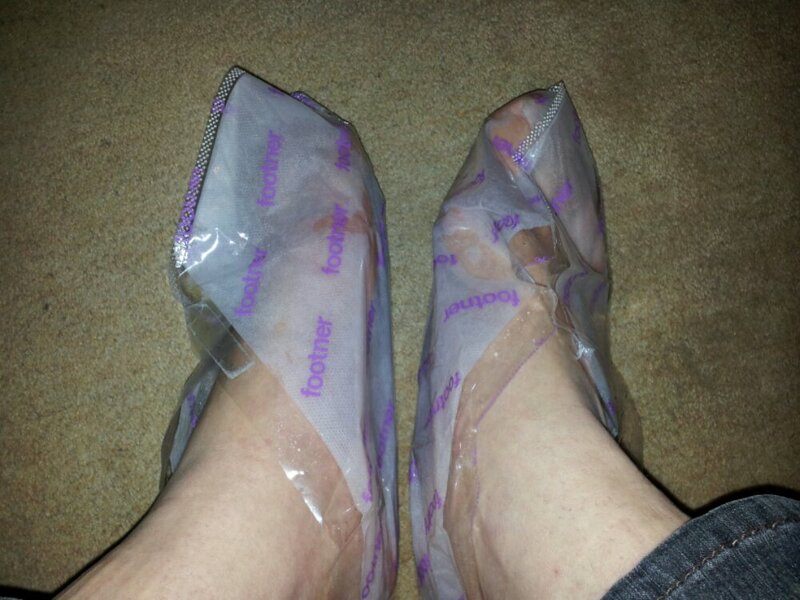 They are a sort of plastic trainer-sock shape, with a lining soaked in a strong smelling liquid/gel. The smell isn’t bad but it is a bit chemically. I really wasn’t sure about this, but I read all the instructions and got on with it. Once you’ve got these on you keep them on an hour – Footners instructions suggest popping your own socks on over the top of these to make it a little more comfortable. I went for old socks as I have no idea if this might bleach or stain the fabric. If this works well I might do this again, as I regularly get hard skin on my heels. I wear summery shoes all year round, and I am not making that up. Sometimes I go barefoot in public, and quite regularly go out in my garden barefooted. I am not keen on hard and rough skin, but files make me cringe, and I haven’t come across a foot cream that actually cuts the mustard for a barefoot fan. The box states it suits feet up to a UK size 11. This concerned me a teeny bit, I am a 10 & 1/2 and often wear 11. I am pleased to say there was no issue. They do feel a little odd, a tingley feeling, but this is normal apparently and the gel in them does feel all kind of squishy and slushy. After having these super attractive beauties on toes for an hour, it was time to remove the socks and rinse. It rinsed off very easily, and I was thinking “its done nothing, what a waste of time” so remember readers, be more patient than me. The skin on my heels looks dry, and is cracking a little. It is not uncomfortable or itchy though. A few days later my skin is peeling from my soles and heels. It is like sunburn peeling, without the sore red patches or itchiness. It doesn’t look attractive, but it is working. The appearance of my skin on my feet is slightly shrunken, and almost scaly. In the mornings I see bits of skin on the bath mat, which is a bit yukky. But it still beats filing and sanding away with pumice stones and industrial grade sandpaper cunningly disguised as pink floral “emery boards”. Just the noise it makes, makes me cringe, it is like finger nails down a black board. So I’m willing to take the slower route here with Footner. About a week and a half after using Footner socks my heels have sheaded all the old hard thick skin. Even though this takes time to work, using the product is easy, and hardly any effort. You just need to remember to use it a clear fortnight before you wanted prettified feet. Great if you’ve booked a beach holiday, or want to get ready for summer, or if like me you really hate foot files and are a little lazy. The downside is the price I’m afraid (I know, there is always a catch on good things) and 1 pair of Footner exfoliating socks cost around £20. But in-salon pedicures can be flipping expensive too, on Google I had a quick nosey, and the salon price lists I found stated between £25 and £65, with £40 ish being more common. To be honest £20 for a Footner is sounding good, plus I don’t have to let a stranger touch my feet, yay! I did attempt to photo my feet, but have you any idea how tricky that is? Go on, I dare you to try to photo the soles of your own feet? You can buy Footner exfoliating socks in lots of shops, including Boots. My advice, if you aren’t in a hurry, buy it! I like the sound of those, though I think the price would make me think twice. Christy Garrett @ Uplifting Families recently wrote… Spring Into Cash Giveaway Ends 4/10/14. These sound great, if only the price tag was a little lower!! Lauranne recently wrote… I’m back. I’ve just bought a pair on Amazon for £14.99!!! I know they work tried them before! !